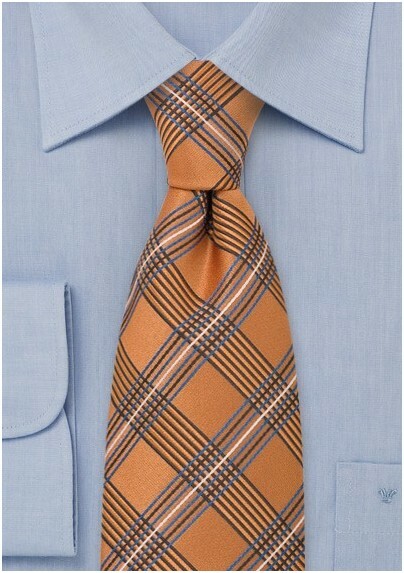 Pump up your menswear look with this sensationally modern plaid patterned tie in burnt orange. The handwoven motif of multi-color stripes resonates with a fashionable chicness that pairs nicely with a range of styles and aesthetics. One of our favorite looks is seeing this tie paired up with a classic white poplin button down and a wool flannel suit in textured graphite grey. 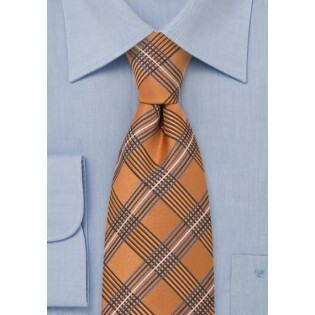 This designer accessory is crafted from an excellent grade silk and is woven using a Jacquard loom.